A route over Avalanche Peak dropping to the Crow River and exiting down the Waimakariri River. 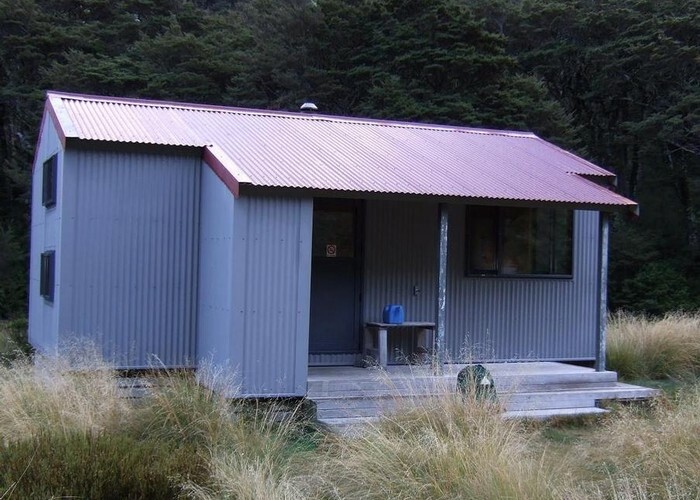 Crow hut (Arthurs Pass) March 2008 • By glennj. Licence: C.
There are 2 tracks leading to the summit of Avalanche Peak. 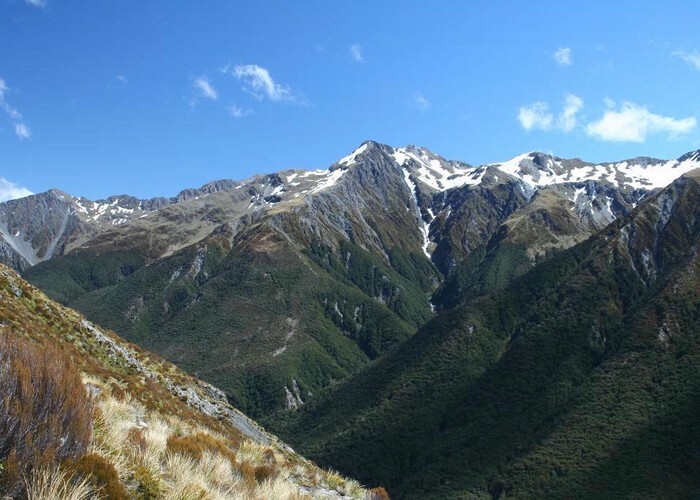 The first track is behind the DoC Visitors' Centre and is called Avalanche Peak Track. The second track is called Scott's Track. The former track is steeper at the start. Scott's Track starts just past Warden's Creek, a hundred metres north of the village. It gently meanders through picturesque stunted bush, giving great views of the Punchbowl Falls, Mt Aicken, Cassidy, Temple Basin, Phipps Peak and Mt Stuart, all opposite. Avalanche Peak • By Matthew. After 600m climbing through pleasant beech forest, you reach the bushline but then briefly pass through an isolated patch of further forest to the tussock zone. Views of the magnificent Crow Icefall, the Crow Face and the profiles of Rome Ridge and Gouldney Ridge materialize as you climb higher. The track is very popular and accordingly eroded into a deep gash in places but never becomes a scramble, more of a rocky staircase. The final push to the summit is via the defined ridge. The rock is stabilized and not at all challenging. Almost at the summit, the ridge flattens out and becomes an argillite pathway, only slightly exposed but intimidating if one has a fear of heights. The summit is a friendly broad triangle formed by the 3 ridges leading off to Mt Lyall, Mt Rolleston and down to the carpark. From the summit, the route drops down briefly to the south before traversing below the summit to a ridge 200m from where one drops off the summit. From the ridgeline one drops down through a tussock basin to follow the ridgeline, now running in a NNW direction to where the Crow Slide is marked by a yellow capped pole and ancient track marker standard, 1.3km from where you came to the ridgeline i.e. about 1.5km from the summit. It is very important to choose where the yellow capped pole is for your descent as any other way is not a goer, leading to tears, rescue or fatality depending on your ability. This pole is 200m north of Pt 1658. The scree is a bit boney and the bottom section where it becomes more gentle and fanned out is particularly unpleasant due to larger rocks. The Crow River itself is very nice travel. There is a subtle unmarked track on the true right which leads to a cairned track over a rocky gentle rise. This takes you to the hut. However, you can stay in the river but be sure not to walk past the hut. We did this in the dark but could smell a little fire going in the hut. A track leads up a small terrace to the hut. This track is also used to get water from the river. There are options to return to the village via the route you came or even to go to the head of the Crow River valley and up onto the shoulder of the Rome Ridge route. In early spring, if avalanche and crevasse danger is absent, the Crow Ice Fall can be ascended hard over on the true right to gain the Crow Glacier. Mt Guinevere rates as a tramper's mountain and can be climbed from Crow Hut. Mt Lancelot is a bit more exposed but easier approached from the western side of the ridge after gaining the basin NW of Crow Hut. Added 1 June 2001 by MatthewMatthew. 2 revisions, most recently 14 September 2014 by HonoraHonora. 332 views in the past year (28 per month).